New York has a really great subway system and I do use it but sometimes circumstances demand that you park yourself on a street corner and hail a yellow cab. My driver this morning had no idea I’d be blogging about him, but he was most obliging in answering questions that reveal the following facts about driving a taxi in New York City. 1) This one is probably well-known but my cabbie mentioned it and I confirmed the costs via a cool little web site for NY taxi drivers. You are not an official taxi cab in New York unless you have a medallion; a small metal disc that’s attached to the hood of the vehicle. They’re, uh, expensive. The city auctions them off. They can go for as high as $650,000 to $700,000. 2) My cabbie today says he works Wednesday through Sunday and starts each day at 5am and finishes up around 4pm. These are not lazy people. My driver will not get in an airport line and wait an hour to get a fare. He says it’s a waste of time when you could be out there prowling the streets. 3) The financial risk is all on the drivers and not on the fleet operator. Depending on the time of day you’re working, the cabbie pays the company anywhere from $105 to $134 each day. It’s up to the driver’s tenacity and good fortune to turn a profit each and every day. The fleet operator, however, is guaranteed their take. This particular fleet is made up of 200 cars. My trusty calculator shows that to be about $23,000 a day, $160,000 a week, $650,000 a month, and nearly 7.8 million a year. Of course, there’s insurance, they have to buy new cars every three years and by 2012, Mayor Bloomberg wants them all to be hybrids. 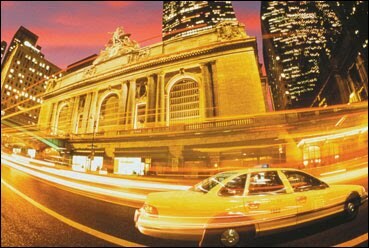 Environmentally-friendly cars should save cabbies on their fuel costs, or so the theory goes. 4) I don’t want to paint all fleet operators with a broad brush, but my cabbie says his guys are cheap, cheap, cheap. They will balk at replacing something as inexpensive as windshield wipers. God knows how they feel about bald tires and transmissions. 5) Miserliness is also prevalent among certain customers. I think there’s a life lesson here somewhere. My driver says that when he picks up a fare on Park, Madison or 5th avenues, 80% of the time he will get virtually no tip at all. Like $11 on a $10.50 fare. Rich people are, apparently, the stingiest of all. This is how they got rich, I guess- fifty cents at a time. Of course, if they’re REALLY rich, they’ll be getting into the back of one of those fancy black cars. 6) Why can’t you get a damn cab when it’s raining? It’s not because cabbies are mean. People who would ordinarily walk or take a bus, are now competing for taxis so your odds of getting a vacant car are significantly reduced. 7) Cabbies are a little bitter about the credit card systems in their cars. They claim to lose 5% on every fare paid with plastic. 8) Passengers are a little miffed at the new 50 cent surcharge imposed this week. Along with the $2.50 start on the meter, it’s now three bucks just to step into a New York City cab. Now this is very helpful information! Thanks Robert. Last week I was forced to take a Gypsy cab (in the rain) from Harlem to Penn Station… except that the driver had no idea where to find Penn Station. That might seem outrageous, except that I understand it happens all the time.